Maurizio Canesso inaugurated his Gallery in 1994, in Paris after 15 years of dealing in Italian Old Master Paintings. You can visit the gallery and see a wide range of works from the Renaissance to the 18th century, principaly Italian artists, but also artists of other schools who worked in Italy. The Gallery offers a considerable choice of subjects from Religious and Mythological to Still life, Landscapes and Veduta and, for the most part, newly discovered and unpublished works. Particular attention to quality and condition are the main preoccupations of the acquisition policy. Close collaboration with art historians and museums demonstrates the Gallery's interest and success in working with Institutions. The gallery participates in two fairs : the TEFAF in Maastricht and the Biennale de Paris in the Carrousel du Louvre. We publish two catalogues every year. Maurizio Canesso will be happy to welcome you at the Gallery to discover the most recent acquisitions (only by appointement) . Right in the heart of the St. Germain Des Prés area, between the well-known "Deux Magots" and within walking distance of the Musée d'Orsay, the Jacques De Vos gallery has specialized in the Art Deco period for 30 years. 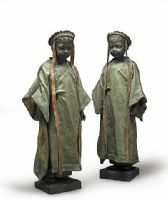 Selling high quality pieces of furniture by Jean-Michel Frank, Alberto and Diego Giacometti, Paul Dupré-Lafon, Pierre Chareau, Jean Dunand, Eugène Printz and André Sornay among the great names of the period, Jacques De Vos is also the world representative for Jean Lambert-Rucki's sculptures. Once or twice a year, Jacques De Vos organizes a temporal exhibition dedicated to one of these major French Art Deco Designers. Events are often underlined by the publication of a catalogue. The gallery is also present in the major prestigious fairs taking place in New York and Florida.